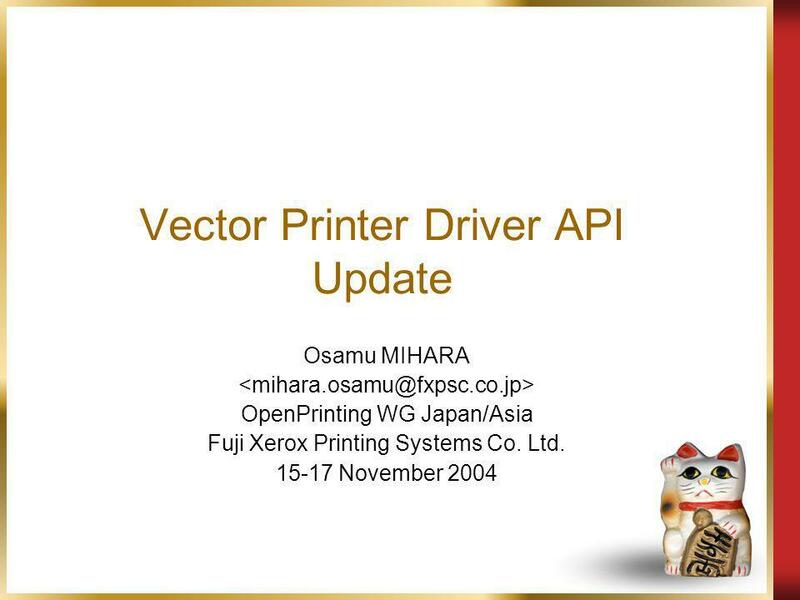 Vector Printer Driver API Update Osamu MIHARA OpenPrinting WG Japan/Asia Fuji Xerox Printing Systems Co. Ltd. 15-17 November 2004. 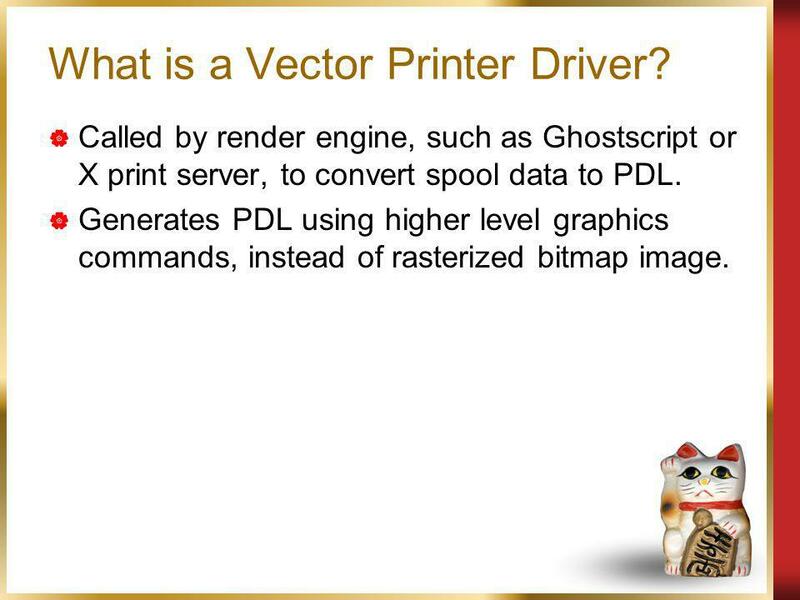 2 What is a Vector Printer Driver? Called by render engine, such as Ghostscript or X print server, to convert spool data to PDL. Generates PDL using higher level graphics commands, instead of rasterized bitmap image. 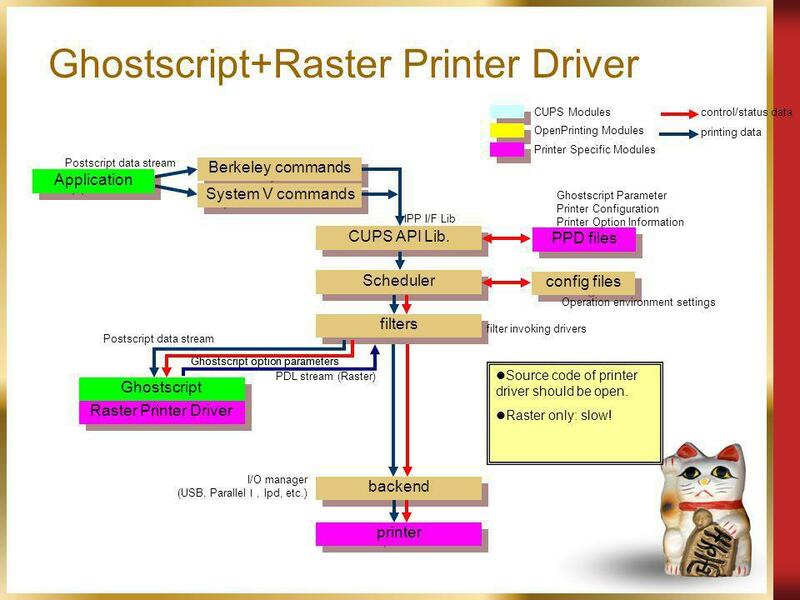 Download ppt "Vector Printer Driver API Update Osamu MIHARA OpenPrinting WG Japan/Asia Fuji Xerox Printing Systems Co. Ltd. 15-17 November 2004." Till Kamppeter, MandrakeSoft, France PWG/FSG OP Meeting, March 31-April 4, 2003 linuxprinting.org and Foomatic The Current Standard for Printer Driver. 2003/06/17Open Printing WG Japan/Asia 1 Open Printing Working Group Japan/Asia Activities Update 2003/06/17 Osamu MIHARA Yasumasa TORATANI. 1Copyright © 2007, Printer Working Group. All rights reserved. PWG Plenary Status Report WIMS/CIM Working Group December 12, 2007 Austin, TX PWG F2F Meeting. 1Copyright © 2008, Printer Working Group. All rights reserved. PWG Plenary Status Report MFD Working Group October, 2008 Lexington, KY PWG F2F Meeting. 1 Copyright © 2010, Printer Working Group. All rights reserved. IPP Everywhere BOF 10 February 2010 Scottsdale, AZ - PWG F2F Meeting. 1 Copyright © 2010, Printer Working Group. All rights reserved. IPP Working Group Session 10 February 2010 Scottsdale, AZ - PWG F2F Meeting. 1Copyright © 2010, Printer Working Group. All rights reserved. PWG Plenary Status Report Workgroup for Imaging Management Solutions (WIMS/PMP) Printer. 1 Linux Open Printing Reference Model Free Standards Group Open Printing Architecture Working Group. XP Creating Web Pages with Microsoft Office 20031.